Is your mouth in bad shape? Do you have broken or missing teeth? Have time and damaging habits taken their toll on your smile? People we have cared for told us in our initial conversation that what they wanted was to be able to enjoy their favorite foods again, they wanted to look better, and they wanted to feel better. They were looking for an overall better quality of life. Some came to us for the great dentistry we can provide, others because they didn’t feel well and thought that our approach to anti-aging, holistic dental care would be of help. It has for many. If you’ve been putting off going to the dentist for years, and are finally ready to do something about it, please talk to us. We are here to get you healthy – no scolding, no lectures, just a healthy mouth in a few relaxing hours with Dr. David Lerner and his team. There are different ways teeth may be replaced or repaired, and different materials we can use depending on your individual body’s chemistry and needs. Be assured we will always determine the best fit for you. Below is a description of the types of restorations used in dentistry. Much of what we need to do in dentistry is involved with the repair of teeth with materials that are as close in appearance and function to natural tooth structure as possible. As dentistry has evolved, a growing number of options have become available to accomplish just that! Though materials will continue to evolve, today’s technology provides us with a broad range of excellent options including white or composite fillings. When tooth decay damages a tooth, it breaks down the hard tissue of the tooth leaving soft, discolored decay. When this is cleaned out we are left with a sterile cavity that has to be repaired. When of a small to moderate size, this cavity can be filled directly with tooth colored composite materials that can be packed and hardened in the tooth. If the cavity is large, stronger and more durable materials need to be used. Are all white fillings created equal? Until recently, most of the white plastic fillings in use in dentistry contained a compound known as Bisphenol A or BPA. This compound is found in many products made of plastic. These compounds mimic estrogen and can cause health issues. The first evidence of the estrogenicity of Bisphenol A came from experiments conducted in the 1930s on rats, but the negative effects were not reported until 1997. Since then, BPA’s endocrine-disrupting properties have been studied in depth. Studies with rats have confirmed that composite fillings containing BPA are estrogenic. For more info see: BPA-Free Products Still Contain Bisphenols of Equal Toxicity. Sometimes teeth have damage that affects a wide area on top or slightly over the side of the tooth. That is when we usually recommend inlays. We’ll place materials that provide the most stable and long-lasting result while preventing adjacent teeth from shifting or a gradual deterioration of the bite. We always use muscle testing to determine the most ideal material for your particular situation. Our inlays are usually made either of gold or ceramics. These restorations are formed on a model of your teeth by our dental technician and then fitted to your tooth and cemented or bonded in place. If your damage is more significant, the strength of your tooth may be compromised. We often see teeth with old mercury fillings that are developing cracks in the enamel and underlying structure because the filling has acted as a wedge in the tooth over time. These teeth are best restored by either an onlay or a crown that reinforces the strength of the tooth by covering a portion of it. 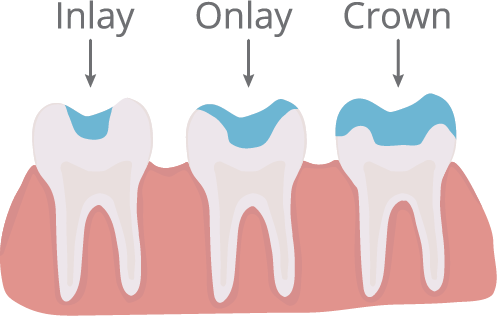 Wherever possible, we prefer to conserve the enamel of the tooth and use an onlay. Today we are able to do this in either gold or ceramic materials. Gold has traditionally been the material of choice, though, with advances in ceramic and bonding technology, the majority of our patients prefer the cosmetically superior ceramic onlay or crown. 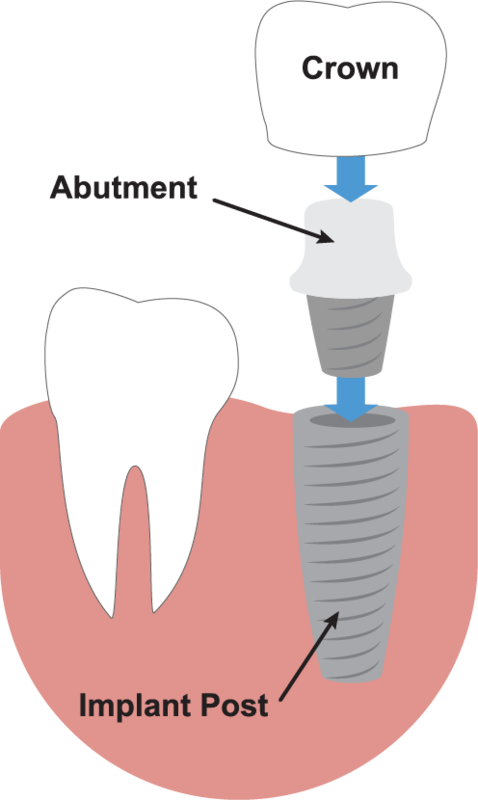 If you are only missing one or two teeth and are not a candidate for dental implants, we usually recommend a dental bridge. 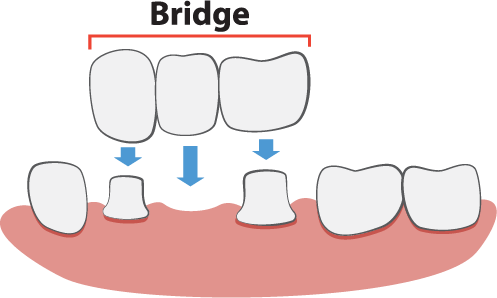 A bridge consists of two crowns that attach a false tooth to the teeth on either side of the missing tooth. But the bridges we offer aren’t just any bridge – ours are comfortable, well fitting, and natural looking, so no one will be able to distinguish them from your own teeth. Not only that, our bridges are fixed in place, meaning that you don’t have to remove the replacement for cleaning. Patients say these bridges are so easy to wear, they often forget they are there! Are you missing all or most of your teeth? You are not alone. Over 20 million people in America are edentulous, meaning “without teeth.” Teeth are necessary components of good health, and without them, millions of people suffer from emotional distress, digestive issues, TMJ disorders, and even malnutrition. But most dentures are uncomfortable and hard to wear, slipping when you talk, or sliding and coming loose when you eat. We can help. We create dentures that act orthopedically, placing your mouth in the optimum position for your jaw and bite to work together harmoniously. This means they will more effectively stay in place, feel better, and look much more natural than traditional dentures ever could. 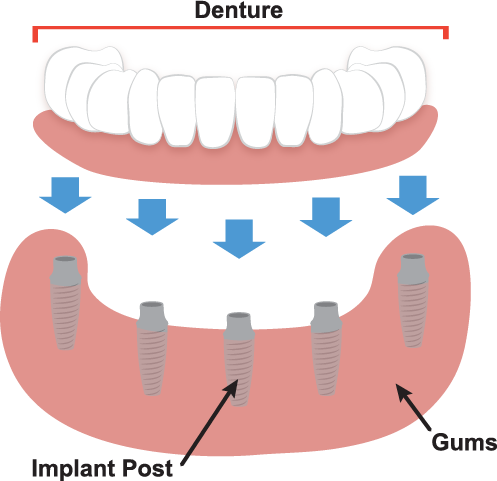 If you are a candidate for dental implants, we can lock dentures in place for the healthiest, most life-like solution. Confidence about your teeth affects how you feel about yourself, both personally and professionally. Perhaps you hide your smile because of spaces from missing teeth. Maybe your dentures don’t feel secure. Perhaps you have difficulty chewing. If you are missing one or more teeth and would like to smile, speak, and eat again with comfort and confidence, we are here to help! Dental implants are teeth that look and feel just like your own. In fact, they are so natural looking and feeling, you may forget you ever lost a tooth! Are your teeth worn down, broken or missing? Do you have pain related to your teeth or jaws? Does your smile make you want to hide? If your teeth appear short and worn, completely overlap your bottom teeth, or if you experience pain in the jaw joint, headaches, back pain, muscle tenderness or clicking or popping of the jaw, consider full-mouth smile restoration from Dr. David Lerner. Having a beautiful smile is important both socially and psychologically; but having a healthy, comfortable smile is more important still. Our smile restoration can do both. You will be amazed at the change it can make, and the results are so natural, others won’t be able to distinguish the real teeth from the restored teeth.